Currently, lighting communication protocols have remained stagnant and operate on a low speed, low adaptability communication platform. 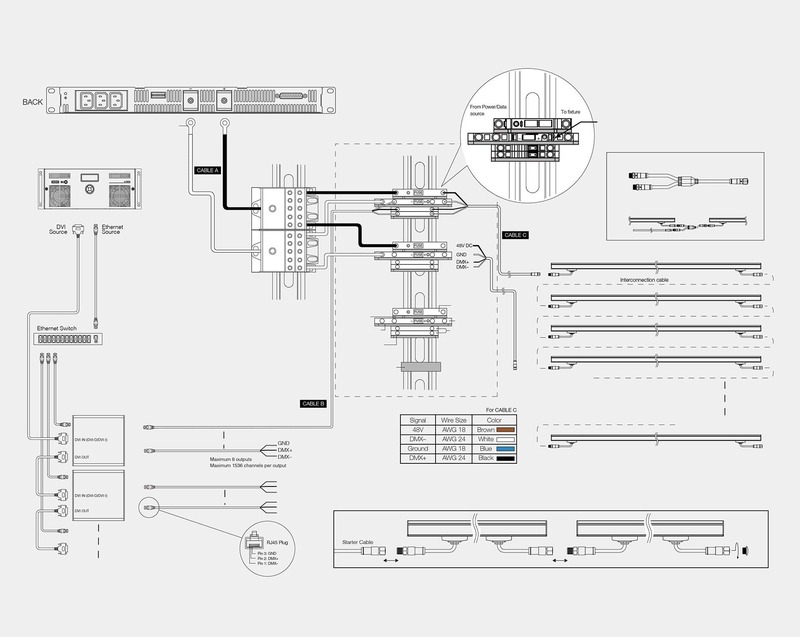 SACO is continuously evolving its product lines and control protocols. SACO believes that to extract the most out of lighting and media applications and products, high speed communication is a minimum requirement. Utilizing a video protocol backbone, SACO is able to feed more data per second to devices in the field, resulting in better control and color fidelity. 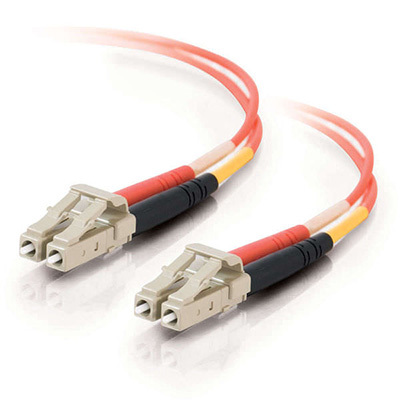 The communication backbone also operates with the latest standards in the broadcast and broadband market, making it adaptable to any type of device, including lighting, media, camera, sensors etc. By using a common communication backbone it is easier than ever to design easy to use GUI’s making the systems easy to use for the client base. 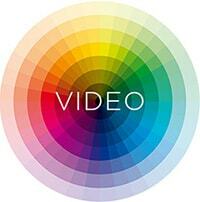 In DMX, each color only has a total of 256 levels, whereas in video, each color has 65,536 levels. The result is directly related to the smoothness of color transitions. With the SACO VIDEO system, color transitions are extremely smooth, precise, and provide the ability to create a lot of subtleties in the content. 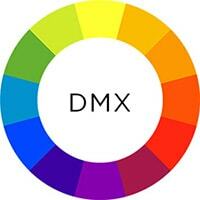 In DMX there are only 51 levels of brightness available in the lower 20% of the brightness curve. This results in choppy color transitions meaning that you visually observe the dimming steps. With the SACO VIDEO system, in the lower 20% of the brightness curve, there are over 13,000 levels of brightness, thus resulting in very smooth dimming. The result is a much more precise, much more elegant and rich presentation of the content, thus enhancing the project as a whole. High speed communication also means less equipment needed to control more devices without syncing issues. For example, for every 170 RGB fixtures, DMX uses 1 universe controller. A DMX universe allows a control of a maximum of 170 RGB fixtures (1 universe=512 addresses). Therefore, once a universe is exceeded, each universe controller requires to sync to the previous unit. A video system allows SACO to control seamlessly and smoothly over 2,000,000 RGB fixtures (1 Video Raster = 6,220,800 addresses which is equivalent to 12,150 DMX universes). In a media application, where there are thousands of fixtures, the amount of control equipment is overwhelming. Furthermore, the technical issues are compounded because the DMX equipment is unable to deal with the amount of data required. By utilizing SACO’s Video system, one video processor (approx. 4 inch square) can run the equivalent of 12,000 DMX universes in perfect sync. Furthermore, the system allows for 3D visualization and instinctively takes care of any shift in geometry. With the SACO Video control system, syncing is never an issue and programming is facilitated with the latest cutting-edge content creation platform. From an equipment point of view, the SACO VIDEO system takes up minimal room and runs the project in perfect sync. (10 times less room than current systems). DMX uses outdated, low speed data transfer technology resulting in limitations of the system. (250Kbit). 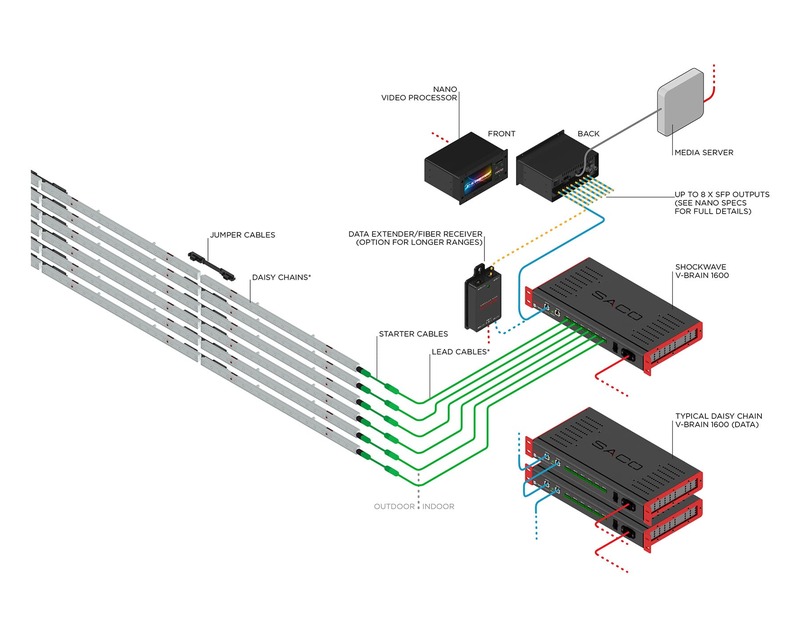 The SACO VIDEO system uses cutting-edge, high speed data transfer technology (1.485GBIT) over fiber optic cable; 5,000x faster than DMX. The result is the ability to control many more fixtures with a small amount of equipment. This also allows SACO to refresh the fixtures @ 5400 Hz, eliminating any kind of flickering often present with DMX. 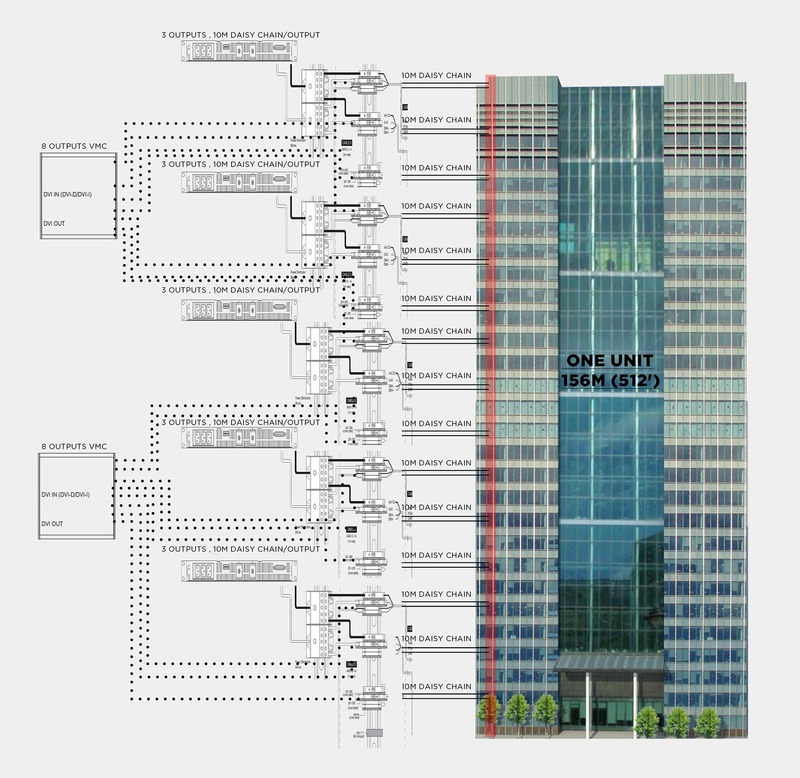 Possibly one of the most important aspects of the system is that it monitors itself and has built-in self-diagnostics. Should there be a problem with any part of the system, the service center and the client receive a message (email or SMS). This allows for remote login and assessment of the issue, and if necessary deploying a local service team. This rapid response provides piece of mind to the client. 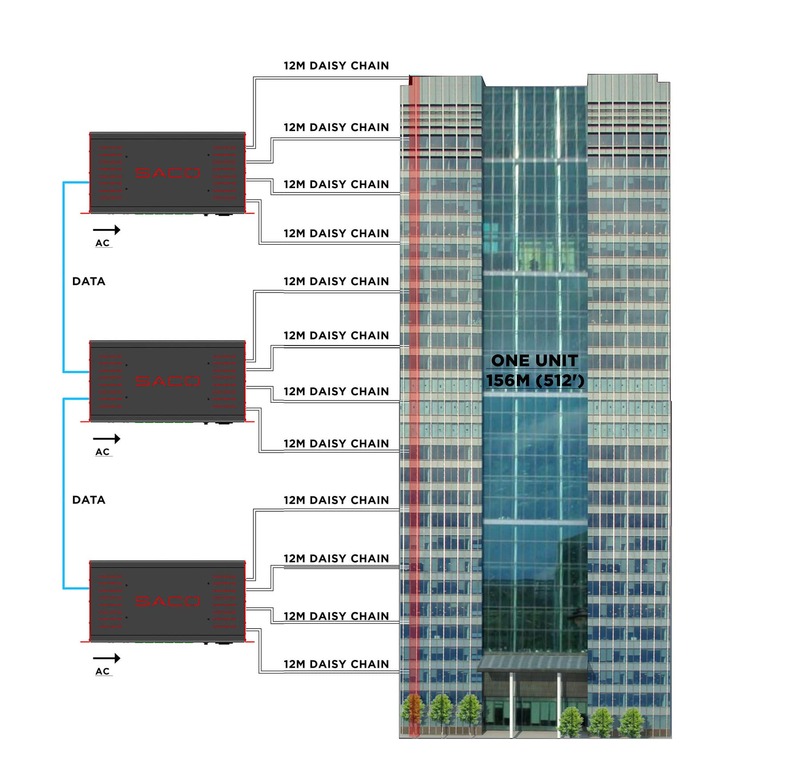 Furthermore, connectivity allows the system to continuously update itself, helping to ensure the system is operating at maximum efficiency. For content programming, this allows for remote upload of new content and scheduling management. This also means that content can be deployed and modified very quickly. Another feature is remote viewing of the content to ensure quality.